Ten days ago we posted a special birthday story in honor of former White Sox teammate Ed “Hoggy” Herrmann. As many of you know, Ed has been battling cancer since 2009. This year, he spent his 67th birthday laying in an intensive care room and fighting off a nasty infection. As of 5pm Thursday Sept 5, Ed is no longer connected to any machines except the IV!! This is great news and worthy of a celebration! To celebrate this news, we wanted to honor Ed’s toughness and somehow find a way to help support his family. 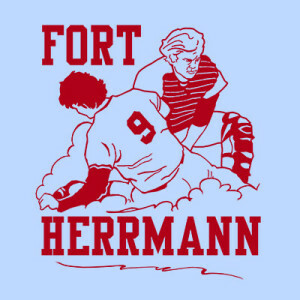 The DA15 team has created a special “FORT HERRMANN” t-shirt — recalling Ed’s legendary ability to block the plate from invading base-runners*. This shirt is only available at the DickAllen15.com store. Available in white, powder blue and grey, this shirt is a great addition to your collection. To make this more tempting… 100% of the proceeds collected from the sales of this shirt will be donated directly to the YOUCARING.COM campaign established to help Ed’s family pay for the growing medical expenses not covered by insurance. There are only 29 days left in this campaign…. so please buy a shirt OR donate directly to Ed’s family today! * Special thanks to White Sox fan Brian (follow him on twitter @Go_GoSox) for posting this image from his old White Sox coloring book page and seeding the idea for the shirt.